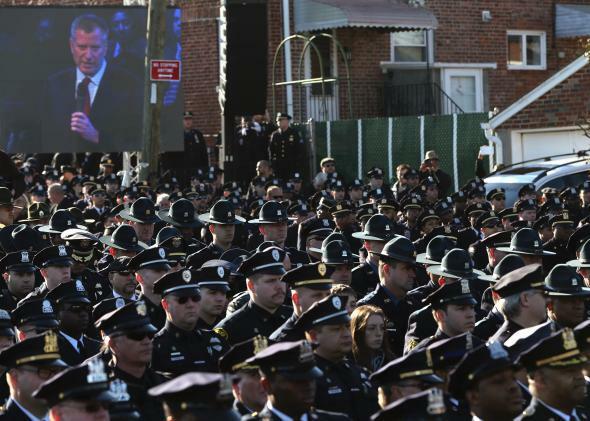 Hundreds of cops turn backs on de Blasio at funeral for slain officer. Law enforcement officers turn their backs on a video monitor as New York City Mayor Bill de Blasio speaks. 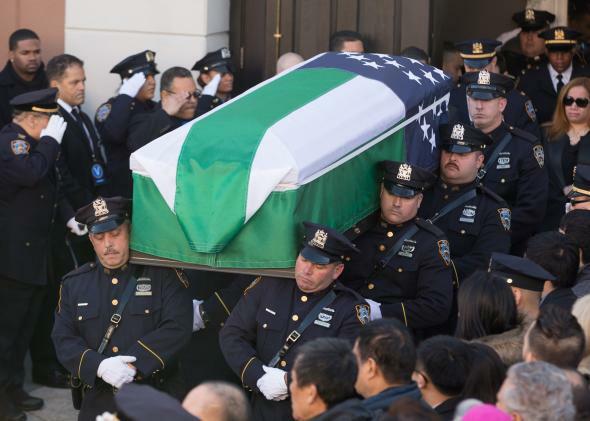 Thousands of New York police officers attended the funeral Saturday for Rafael Ramos, one of the two police officers killed in Brooklyn last week, and they were joined by colleagues from across the country for what the New York Times says was “one of the largest send-offs in the history of the department.” At a time of increased tension between police and the communities they serve, many felt the need to express support for the cops. But it was clear that requests to leave politics out of Ramos’ funeral in Queens had fallen on deaf ears as soon as New York Mayor Bill de Blasio got up to speak. 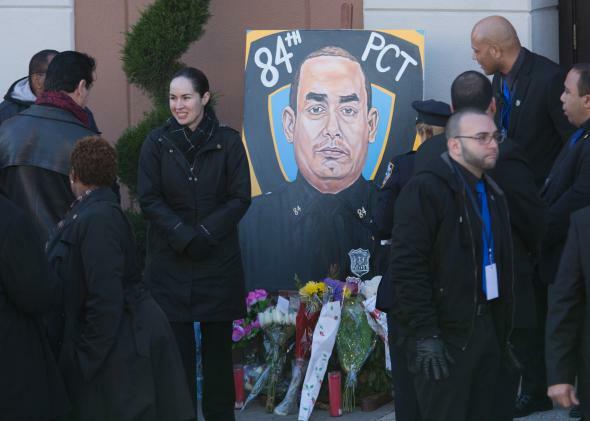 A portrait of New York Police Department Officer Rafael Ramos outside his funeral at the Christ Tabernacle Church in Queens. Hundreds of police officers who were outside the church turned their backs to the monitors that were broadcasting the service as soon as de Blasio took the podium. The move was a stark illustration of how tensions between police officers and de Blasio have not cooled a week after police officers turned their back on the mayor at the hospital after the shooting. Before the funeral started, a sign reading “Dump De Blasio” was held up as the mayor entered the church. The sign came out a day after a coalition of retired police officers hired a pilot to fly across the city with a message: “De Blasio, Our Backs Have Turned To You,” notes the New York Post. 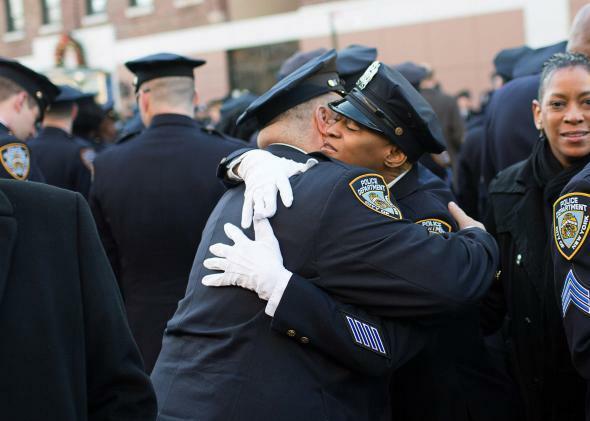 NYPD officers embrace before the funeral of slain Officer Rafael Ramos. 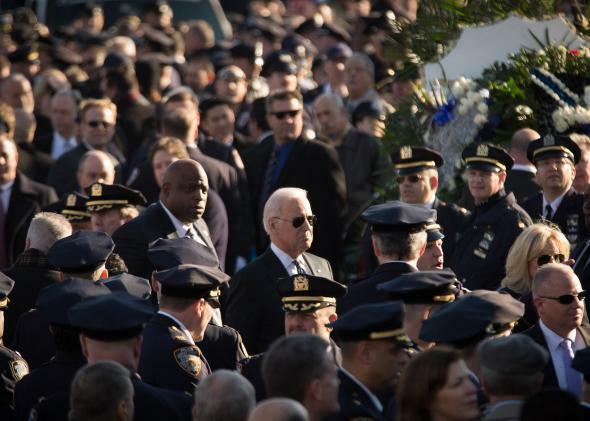 U.S. Vice President Joe Biden arrives outside the funeral of slain NYPD Officer Rafael Ramos. Pallbearers carry the casket for the funeral of slain NYPD Officer Rafael Ramos at the Christ Tabernacle Church in Queens. *Correction, Dec. 29, 2014: This post originally misspelled NYPD Commissioner Bill Bratton’s last name.